An international committee that recognizes the naming of asteroids has accepted the nomination of Computer Science Professor Emeritus J. N. Patterson "Pat" Hume and Department of Physics Professor Emeritus Donald Ivey, naming an asteroid in the Main Belt orbit, “HumeIvey”. Hume (1923 - 2013) was one of the three founding members of the Department of Computer Science. Ivey is a former principal of New College and former Vice President of U of T.
Together, Hume and Ivey helped shape the teaching of physics through educational videos. In 1958, Hume and Ivey launched their first local television series for the Canadian Broadcasting Corporation (CBC). The first series was called Focus on Physics which was part of a larger educational series called Live and Learn. 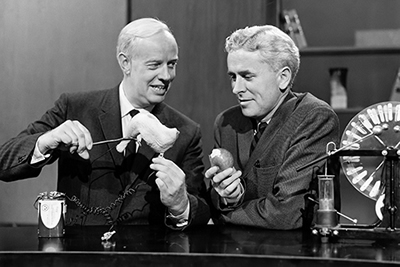 The collaboration continued through 1959, as Hume and Ivey wrote and presented a second series, Two for Physics, which was broadcast on national television. In 1960, the CBC launched a revamped half hour version of the science series and called it The Nature of Things. Ivey was the host and continued to work with Hume to write and present several episodes. Both are regarded as being among Canada’s preeminent scientists. The International Astronomical Union (IAU) Minor Planet Center (MPC) is the single worldwide location for receipt and distribution of positional measurements of minor planets, comets and outer irregular natural satellites of the major planets. The MPC is responsible for the identification, designation and orbit computation for all of these objects. The asteroid HumeIvey (22415) appears on page 937 of the MCP record and further summary and technical data is on their website. The nomination was first submitted in 2008. Nominator Peter Jedicke is a Western University graduate and former president of the Royal Astronomical Society of Canada. His brother and co-nominator Robert Jedicke, a U of T physics graduate, discovered the asteroids for which they’ve proposed names, while at the University of Arizona. His is currently a professor with the University of Hawaii Institute for Astronomy. Peter Jedicke maintains a web page with informal summaries of asteroid names that have a Canadian connection.